Chinese Investors Aren't Snatching Up Detroit Property, Yet While Chinese investors have been eyeing cheap real estate in Detroit since the city's bankruptcy filing last year, they're not in a tremendous rush to buy. After Detroit filed for bankruptcy protection last summer, the media was flooded with stories about Chinese investors pouring money into real estate there. Headlines like this one summed it up: "Chinese investors are buying up Detroit." When you look closer, though, there isn't much hard evidence to support such a dramatic claim. Chinese investors are eyeing Motor City property, but they don't seem to be in a big rush to buy. To David Szymanski, chief deputy treasurer for Wayne County, Mich., one particular metric supports this claim: the county's annual tax foreclosure auction. The auctions, Szymanski says, "sell thousands and thousands of parcels of property at very reasonable prices." The auction went online three years ago, allowing investors from all over the world to bid. Last year, nearly 20,000 properties hit the auction block, the vast majority of them in Detroit. Ninety-nine percent of buyers at the auction are still based in the U.S., Szymanski found, and while a tiny portion of sales did go to foreign investors, not a single purchase appears to have come from China. The impression that Chinese investors were buying many properties didn't appear out of nowhere. It started with those headlines about the bankrupt city, which were seen around the world and sparked excited Internet chatter as people in China learned of the incredibly cheap real estate. Some Detroit real estate agents started talking about growing interest from Chinese property buyers, many of whom wanted to make cheap bulk purchases. Then, a China-based international real estate website listed Detroit as the fourth most-popular U.S. city for Chinese homebuyers. Those rankings came from counting search terms, however, not tracking actual deals. Admittedly, the foreclosure auction data that Szymanski cited is also an imperfect measure of foreign investment. Overseas buyers can hire a U.S. agent to bid on their behalf, and there are other ways to buy property. But still, Szymanski says, all this talk about massive Chinese investment in Detroit real estate seems to have been exaggerated. 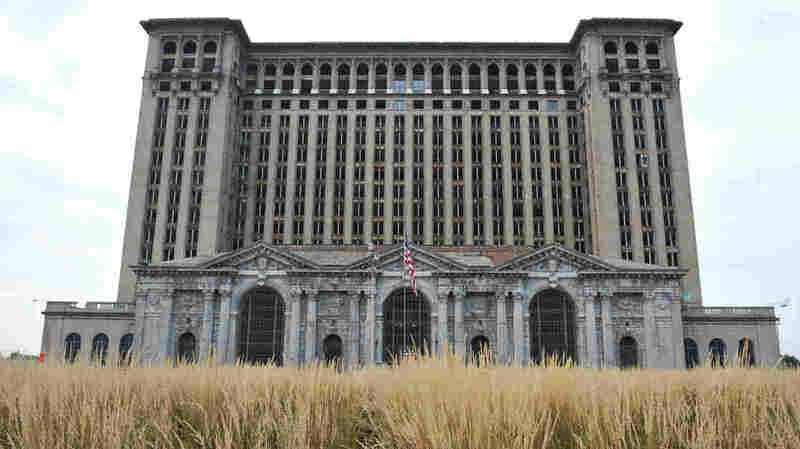 "This thought that the rest of the world is buying Detroit seems to be misplaced. Although, I'll be very honest: I want the participation of other countries," Szymanski says. "I would love to see the money flow in." Many people feel that way. Detroit's many abandoned homes and vacant properties are a big reason why the city went bankrupt. While a Chinese land-buying spree in Detroit still seems pretty minimal, there are some strong signs that Chinese investors have a growing interest in the city. Jerry Xu, president of the Detroit Chinese Business Association, agrees. While most Chinese investment in Detroit thus far has been in the automotive industry, real estate has also become a hot topic in China, Xu says. "We have the most beautiful riverfront, and we have lots of beautiful buildings," Xu says. "If you can polish [it] up, it can be a top-notch building." Xu says that process is "just getting started." Late last year, a Shanghai-based investment group, DDI Group, bought three major historic commercial buildings in downtown Detroit, sight unseen. They couldn't believe the price tag. State and local political leaders have also played a big role in courting Chinese investment. Michigan Gov. Rick Snyder, who has visited China every year he's been in office, was the keynote speaker at a Detroit Chinese Business Association gala in February. Not everyone in Detroit is thrilled by this. With so much cheap land available, there are fears that these big purchases could concentrate ever-more land in wealthy investors' hands. And when those buyers are from overseas, people can get even more uneasy. But that's not a big concern for Detroit resident and property manager Eric Criteser — at least not yet. He says he's more concerned about finding community-minded investors who do quality work and less about where the money comes from. Even though his business is still new, Criteser says, he's already hearing from some international investors. "Here I am, a small fry, and I get phone calls from people in Hong Kong." Firm numbers are hard to come by, but so far, most available records and anecdotal accounts point to a diverse mix of local, national and international players in Detroit's real estate scene. So while this idea that Chinese or other foreign investors are swallowing up Detroit may be overhyped, people are interested. They're just doing more shopping than buying at the moment.